Supreme Lending 247 | Home Loans | Supreme Lending | To Sell or Not to Sell? The Marital Home: To Sell or Not to Sell? 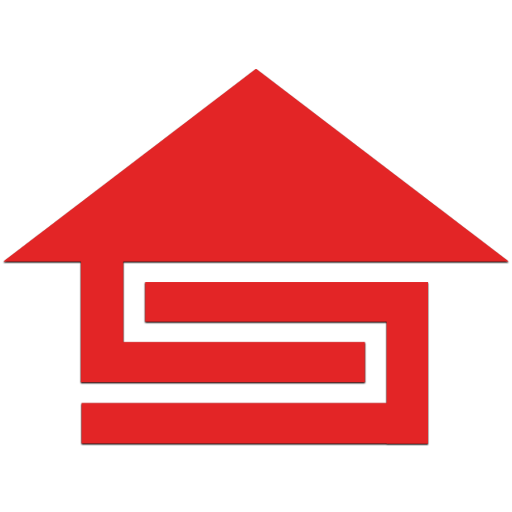 When there is a marital home (or other real estate) involved in a divorce situation, the same question almost always arises: “What should we do with the marital home?” Typically, many reasons to keep the home and many reasons to sell the home are present and as the advisor, a neutral approach is needed to separate the emotion from the economics. Do we keep the home until the children are out of school? Do we sell the home, divide the proceeds and go our separate ways? Do we have any equity in the home or are we underwater? Do we refinance the home in one of the spouse’s name only? Do we sell the home and each rent until ready to purchase again? Each question is a valid question; yet each question may also have its own set of consequences that need to be addressed. While the housing market continues to recover making it somewhat easier to answer questions where equity is a concern, many divorcing clients may still need guidance for their post-divorce housing. When the decision has been made to sell or to retain the marital home, a new set of questions is derived and the question of current value is always at the top of the list. When selling the home, working with a professional real estate agent can help determine the value or best selling price. When the decision is made to retain the marital home and refinancing the mortgage into one spouse’s name, an appraisal from the lender’s appraiser is required. Obtaining an independent appraisal PRIOR to refinancing will only incur additional costs for the divorcing clients as the lender will always require their own appraisal. When divorcing couples face selling the marital home with a mortgage still underwater in a short sale or even faced with foreclosure, it’s important to document this event in the marital settlement agreement for future mortgage financing. Documenting these events in the marital settlement agreement may help clients meet the extenuating circumstances for a shorter waiting period before obtaining future financing. Fannie Mae updated the Seller Guide with regards to Extenuating Circumstances for Derogatory Credit which may help to benefit Divorcing Clients. Extenuating circumstances are nonrecurring events that are beyond the borrower’s control that result in a sudden, significant, and prolonged reduction in income or a catastrophic increase in financial obligations. Documents that illustrate factors that contributed to the borrower’s inability to resolve the problems that resulted from the event such as a copy of insurance papers or claim settlements; property listing agreements, lease agreements, tax returns (covering the periods prior to, during, and after a loss of employment), etc. When you are working with divorcing clients and the divorce decree makes note of the clients filing bankruptcy, agreeing to short sale the marital home or allow the home to go through the foreclosure process, the clients may qualify for a shorter waiting period to purchase or refinance due to extenuating circumstances. It is important to note however, that the event must be documented in the divorce decree as related to the divorce process. Knowing the facts with regards to divorce and mortgage guidelines can significantly help your divorcing clients. 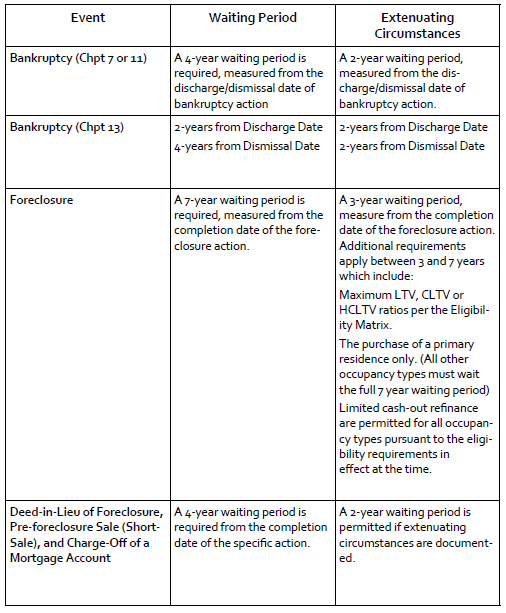 The chart on the following page shows that the waiting periods for future mortgage financing when divorce is documented as an extenuating circumstance can cut the waiting periods down to 50% of the current required waiting periods. This is for informational purposes only and not for the purpose of providing legal or tax advice. You should contact an attorney or tax professional to obtain legal and tax advice. Interest rates and fees are estimates provided for informational purposes only, and are subject to market changes. This is not a commitment to lend. Rates change daily – call for current quotations.